Mix cake as directed and add sour cream to strawberry cake batter. Divide into lined cupcake pans. Fill them just over half way. Mix up the filling until smooth and drop 1 tablespoon onto each cupcake. Bake at 350° for 15-20 minutes. Mix frosting in mixer until smooth. Strawberry Topping: Chop strawberries, add sugar, and set aside to let the juices come out. 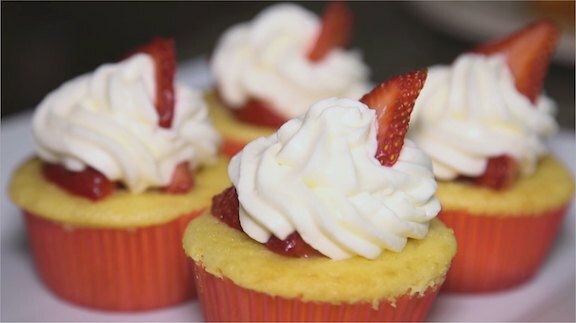 Poke holes in the top of your cupcake and top with a big tablespoon of strawberries and juice. Frost and serve.